Welcome back! Last time I was talking about the basics of book typesetting and layout. Here’s some more basics for anyone starting out. As always, feel free to ask questions. For bound books 6″x9″ or smaller, use 0.5″ margins on the top, outside and bottom of books, and a 0.75″ inside margin. For 8.5″x11″ documents (bound or unbound), use 1-inch margins. Adjust margins, font size, and columns to produce 65-70 characters per line (including spaces). Printers often require a minimum of 1/2 inch margins. Narrower margins risk smearing wet ink as the printing press’s rollers move the paper. YES! It is the standard for a book. Make sure that you justify your text, however, be careful not to leave “open lines”, or large spaces between words because of the justified text. This looks very unprofessional. Using Ragged Right text is another option which can be used for certain instances, quoting text, narrow columns. Around graphics, you may need to look at the text and choose which one works best. Leading (which is pronounced “led”, as in: “he led you to the store”) is the space in between lines of text. It’s also called spacing, as in single-spaced, double-spaced, etc. Fonts and leading are referred to as two numbers. E.g., “12/13” or “12 on 13 points” is a 12-point font with 13 points of leading. Single-spaced can be the same as the font size (called solid), e.g., a 12-point font on 12-point leading. Or it can be the font size plus one point, e.g., a 12-point font on 13 points of leading is single-spaced. Check what your word processor does. A 12-point font with one-and-a-half spacing is 18 points of leading, or 12/18. To a typesetter, a header means a chapter or section title. What your word processor calls a header is called a running header by a typesetter. 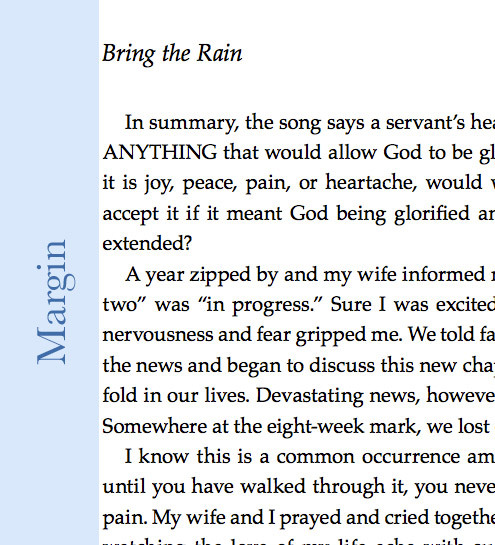 Page numbers should at the outer margin of the running header. Use a font family distinctive from the text font family, e.g., Helvetica for the running header if your text is Times Roman. Also use a font size distinctive from the text font size, e.g., 10 points for the page number, if the text is 12 points. The Chicago Manual of Style (1.94) advocates not putting the book title in the verso (left hand) running header. They reason that your readers don’t need to be reminded what book they’re reading. However, if a reader photocopies your book and the title is in the left hand header the title will show on each copy. 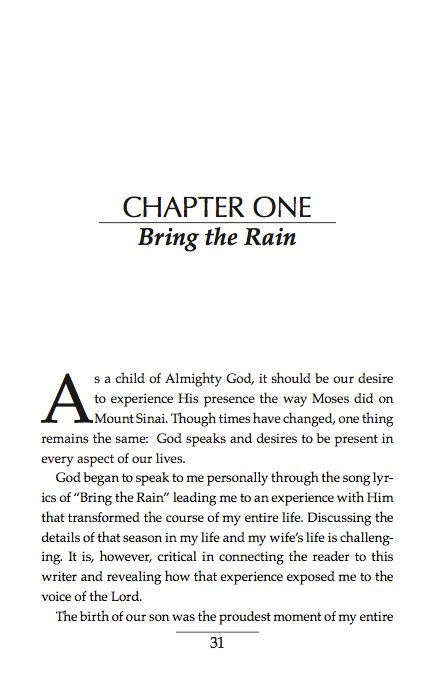 The ﬁrst page of each chapter should not have a running header. Simply put, you should use simple italics to emphasize words. These should all be avoided unless you want to express something very specific like “YELLING”: Capital letters, bold (this will change the “color” of the whole page, underlining (people will try to click it thinking it’s a link in their mind), or large letters if that can be helped. Simple is best. I’ll keep this simple. Don’t do it. Double spacing is a thing of the past and is no longer the standard. For a more in-depth history, check Wikipedia. If you have a document that is double spaced, do a simple “find/replace” and replace ” ” with ” ” for a quick fix. Reading is a skill we learn and practice daily. What most readers don’t consider, though, is the work that went into formatting the books they read every day. Over the coming weeks, I’d like to provide some brief pointers for those who are interested in typesetting a book. Unlike most other forms of design, a book that looks unique and artistic is often unprofessional, and usually hard to read. Your goal should be to create an eye catching cover, chapter titles and running headers, while keeping the main text simple and easy to read. The following are some of the basics that need to be considered before you embark on your project. I will be discussing these elements, and more, in my upcoming posts. Which Fonts you will use (I would recommend using only 2-3 fonts in a book). A common mistake is to choose large fonts because they’re “easier to read”. That might be true – but, fonts that are too large look like a children’s book, and in the long run, your eyes actually have to move more, and turn more pages! Fonts that are too small are difficult to read for anyone, but especially for older people or people who don’t read much. Do not go smaller than 8pt for a serif font. Do not go smaller than 10pt for a sans-serif font. 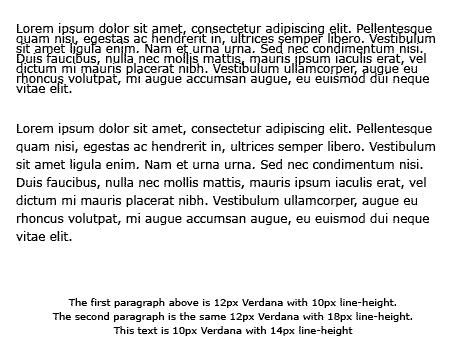 Compact-width fonts, e.g., Times Roman, look best in 11 or 12 points. Wider fonts, e.g., Palatino, look best in a smaller font size, usually 10 or 11 points. “Large print” books are at least 14 points. Never Use Mono-spaced fonts for a book (beware, they have serifs). Each letter has the same spacing, period. 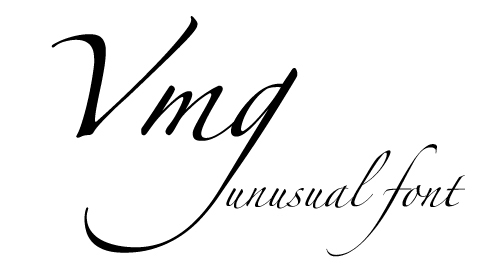 Look at the image, the “iii” is the same space as “mmm”, but because it is a vertical letter, you eyes see lots of negative space, where the mmm are very close together and hard to read. These fonts include New York, Geneva, Monaco, and Chicago. These were designed to look good at the low 80 dpi resolution of the original Macintosh and its Image Writer printer. Modern printers are at least 360 dpi. Don’t use these fonts unless you’re trying to make your document have that authentic 1984 birthplace-of-desktop-publishing look. 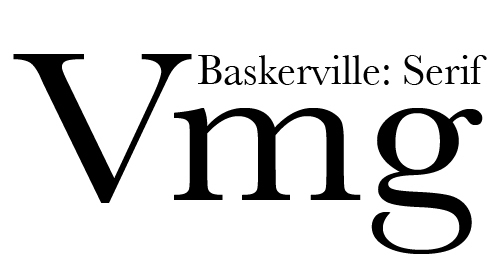 Use unusual fonts only for short items, e.g., the title and author’s name on the cover, or for chapter titles. That’s more than enough for today – but stay tuned, there is more to come!